Mazda rolled out its turbocharged Mazdaspeed Miata to journalists in Rehoboth Beach, Delaware, which is a fine location for testing the car’s beach-cruising capabilities, but a little tougher spot for exercising the car to its potential as a corner-straightening sports car. To aid in its ability to attract attention while cruising, the Mazdaspeed Miata wears cool 17-inch Racing Hart wheels wrapped with P205/40R-17 Toyo Proxes high performance radials, an air dam under the front bumper, and a spoiler on the trunk lid. The turbo car is available in two colors, Velocity Mica Red and Titanium Gray Metallic. Tinted headlight covers complete the car’s serious appearance. 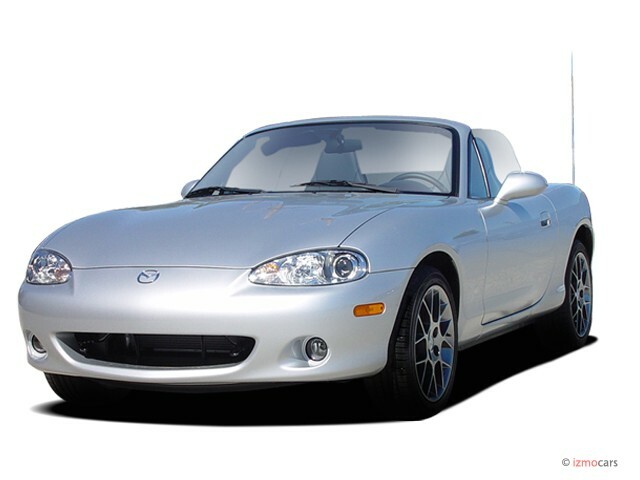 So, for the cruisers, we can confirm the Mazdaspeed Miata enjoys improved top-down pose potential at the beach scene. But the real news is for sports car nuts: Mazda has bolted on all of the go-fast aftermarket upgrades that you’d ever want on your new roadster and wrapped them up with a warranty, a great price, and new car financing. If the purpose of your aftermarket tuner parts is to customize your ride, then this probably won’t be the way to go, since all the other turbo Miatas will be pretty nearly identical. If your purpose is to get the maximum Miata for the minimum outlay, you will never be able to beat the Mazdaspeed Miata and its MSRP of $25,500. Another $700 gets you the leather seats instead of fabric and fabric top instead of vinyl. 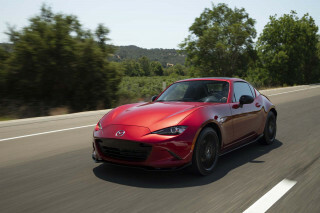 Add the optional six-speed manual and anti-lock brakes to a Miata LS, and the price is higher than the Mazdaspeed Miata, which includes both of those items, plus the aforementioned Racing Hart wheels, which would cost plenty if bought separately. But the Mazdaspeed Miata’s most significant addition is the IHI single-scroll ball-bearing turbocharger, which pumps up the Miata’s 1.8-liter DOHC motor to 178 horsepower from 142 horsepower. The blower breathes through a Denso air-to-air intercooler that mounts just ahead of the larger radiator. So yes, the turbo Miata is quicker than the non-turbo, helping Mazda fortify its position against the likes of the BMW Z4, Honda S2000, and new Mercedes SLK320. Getting the turbo without spending thousands on an aftermarket kit is worth, well, all the money saved and the weekend spent enjoying the car instead of hunched over the engine bay swapping parts. Getting a turbo that you can trust not to melt the pistons and strand you at the most inopportune time possible (what were you doing in that bad neighborhood in the first place?) is priceless. Enjoying the peace of mind of Mazda’s four-year warranty and free roadside assistance is even better. If you only consider this car to be all about the turbo and the dress-up parts, and it would be a bargain. But Mazdaspeed went all the way on the Miata, substituting 1000 parts compared to the regular car and giving enthusiasts pretty much a parts catalog worth of goodies to go with the engine. Changes to the engine itself include reshaped pistons that drop the compression ratio from 10.0:1 to 9.5:1 and beefed-up connecting rods. The regular car’s variable valve timing equipment is dumped, rendered unnecessary by the turbo. The engine drives through a stronger clutch and pressure plate to the six-speed manual gearbox that is now stuffed with shot-peened gears for maximum durability. Out back, the Bosch limited-slip differential sends power to the wheels through larger, 25-mm diameter axle shafts. While the turbo adds a nice power boost to the Miata, it is probably wishful thinking to believe that its 166 lb-ft of torque poses any threat to the standard axles. But a few years back, Honda found while developing the S2000 that the sensation of acceleration depends on reducing fluctuations in acceleration when a car takes off, and that the best way to do that is with fat axle shafts. So drivers can expect the car to feel quicker too, which is the only criterion that really matters outside a Sports Car Club of America Spec Miata race. On the road, the pumped-up motor is reminiscent of Volkswagen’s popular 1.8-liter turbo, with minimal turbo lag and a consistent spool-up to pressure. Cruising in the beach traffic, the turbo has an audible whistle at low speeds, but at highway speeds it is only occasionally audible and is never intrusive. If this were a do-it-yourself job, it would be described as very sanitary. But the Mazdaspeed Miata earns this month’s Ginsu Knife But-Wait-There’s-More Award for piling on the goodies above and beyond reasonable expectation. Not only do you get the turbo motor, wheels and dress-up kit, plus the stronger drivetrain, you also get all of the aftermarket suspension add-ons you could want to tweak the handling for quicker response. How about shorter, stiffer springs that drop the ride height by 7 mm? Revalved Bilstein shocks? Fatter 23 mm front and 14 mm rear sway bars? And of course that de riguer aftermarket bolt-on, the shock tower brace? It’s all here, plus a quicker-ratio 2.3 turns lock-to-lock steering rack, in place of the standard 2.7-turn rack, just in case the steering seemed a tad sluggish before. Bet you won’t find a faster steering rack in many aftermarket catalogs. The 7-mm drop doesn’t exactly slam the Miata down onto the street, and the stiffer springs don’t impart that now-my-car-is-useless ride so common with aftermarket suspension kits. In fact, the ride is hardly discernibly different from the regular car’s ride and remains more plush than, say, the S2000’s. Likewise, the quicker steering is nice, and weekend autocross parking lot competitors will surely appreciate the difference, but there is no danger of it being declared too quick, as happened to the S2000 before Honda took a step back to a slower ratio for 2004. As ever, the shifter is one of the best in the business, and the clutch and brakes serve as textbook examples. So here the Mazdaspeed Miata stands, at the top of the Miata heap. It is unquestionably the fastest, best handling, best-equipped Miata ever offered, providing a ton of upgrades for nearly no additional cost. These improvements will let the Miata go out with a bang. But the next Miata is surely already casting a shadow over even this thrilling sports car. The Ibuki concept car may have shown the future of the Miata, with styling that harkens back to the original car and underpinnings lifted from the RX-8. With that car’s front-mid-engine layout, and the overdue replacement of the current car’s iron-block 1.8-liter engine with the company’s new aluminum engine, the next Miata will be even better. We’ll be happy to entertain ourselves with the Mazdaspeed Miata turbo in the meanwhile. This is a fun car giving you more smiles per mile than anything else in this price range.